We are a band of Ex and Serving members of the British Army who served with, or were attached to, the Royal Regiment of Artillery. We want to help reunite all those comrades who have lost contact, and then maintain that contact. What we hope to achieve through this website is the continued comradeship that the Royal Artillery gave to us. We are willing to put up photographs, requests for contacts, stories, personal history's, in fact anything to do with the Royal Artillery. We need to maintain contacts, because you never know when you are going to need help. We will try to include information about the goings on in the Royal Artillery, Reunions, Association news, etc. If you are an ex or serving member of the Royal Artillery, or have some attachment to the Regiment, then please send me any information that you feel would be of benefit to all. This site is unofficial and not funded so please bear that in mind if you ask for something to be posted, it may take a while but it will get on here sooner or later. If you would like to recommend a link to a web site, make suggestions or useful criticisms about this site then please use the 'Webmaster' links to email us direct. The R.A. Club is on Yahoo! (soon to be Yahoo! Egroups) and is open to everyone. Whilst the R.A. Group, which is on Egroups (soon to be Egroups Yahoo! - I hope you are all following this) is only open to ex-members of the British Army who belonged to, or were attached to, the Royal Regiment of Artillery. 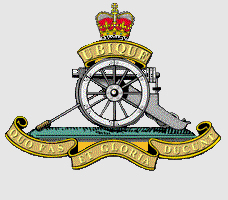 So if you are interested in the Royal Artillery please visit the Club. If you are an ex or serving gunner then why not visit both. By Clicking on the 'Send Your Info' button you will be presented with a form for you to let us know your details and how you would like us to help you. Please use it as someone somewhere may be trying to contact you. Finally there is a link to the Royal Artillery Bulletin Board where you can leave messages in the hope that someone will see them or just write anything that you feel will be of interest to other comrades. Please try to visit the board regularly as someone may just be looking for you.